NASHVILLE, Tenn. (AP) — Pekka Rinne is off to an even better start than last season when he finally won the Vezina Trophy as the NHL’s best goalie, and backup Juuse Saros ranks among the league’s top 10 for victories. With both goalies now signed to contract extensions, the Nashville Predators may have the best goalie situation both on and off the ice. So far, the defending Presidents’ Trophy winners are doing just that. The Predators went into Tuesday night’s game in San Jose atop the league standings while also first in the NHL both in goals allowed (37) and 2.12 goals-against per game with Rinne and Saros (7-2-0) splitting the first 18 games. Rinne has been “ImPekkable” with a 6-1-1 record, leading all goalies with at least eight starts with a 1.47 goals-against average and .951 save percentage. “Every day he is and continues to be the backbone of this organization and team and has probably had the biggest impact on this organization,” Laviolette said. Rinne is 3-0-1 with a .740 goals-against average and .976 save percentage and a shutout, stopping 121 of 124 shots faced since returning from injured reserve on Oct. 31. The Predators signed Rinne to a two-year extension taking him through 2020-21 on Nov. 3, and the goalie celebrated both the contract and his birthday with his second shutout of the season. 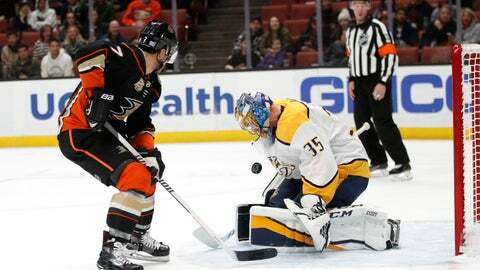 Biron said Tuesday that he doesn’t see a big competition for the starting job in Nashville. “It’s Pekka’s job, and Nashville giving him that two-year deal I think is basically saying that ‘We want Pekka, and it’s going to be like that,'” Biron said. Rinne has been a Vezina finalist four of the past eight years, making the seven-year, $49 million contract he signed on an earlier birthday in 2011 worth every penny. That deal ties him for the fourth-priciest contract among goalies with Marc-Andre Fleury (33) of Vegas and Boston’s Tuukka Rask (31). Fleury is under contract through 2021-22, and Rask hits free agency after the 2020-21 season. The Predators signed Rinne to a two-year extension worth $10 million on Nov. 3. General manager David Poile also signed Saros, 23, to a three-year extension in July worth $4.5 million. That means Nashville is projected to drop from seventh with $8.5 million of its salary cap invested in goaltenders to ninth next season with a $6.5 million average annual value, according to Sportrac.com. Rinne could’ve pushed for more money. Montreal’s Carey Price, 31, is getting $10.5 million a year, while Henrik Lundqvist of the Rangers is being paid $8.5 million a year through 2020-21. Biron calls Rinne one of the hardest-working goalies he’s ever seen who’s in unbelievable shape. He also sees Rinne simplifying his game as he got older, like Patrick Roy, Dominik Hasek and Eddie Belfour. Rinne still can scramble and react, which Biron thinks will keep Rinne playing at a high level for possibly four more years like Lundqvist. “Pekka can play at least through this next contract, and then after that we’ll see,” Biron said. It’s up to Nashville to make that extra cap space pay off after losing the 2017 Stanley Cup Final in six games and then in seven games in the second round last May. Poile persuaded defenseman Ryan Ellis to take a bit less money with an eight-year deal for $50 million in August, and his next task will be trying to get captain Roman Josi to agree to an extension next summer before the final year on the defenseman’s current deal. Tom Wilson of the Capitals returned to the lineup Tuesday night at Minnesota after arbitrator Shyam Das reduced the forward’s suspension by six games to 14 for his illegal check to the head of St. Louis forward Oskar Sundqvist at the end of the preseason. He made an immediate impact, scoring a first-period goal in a 5-2 victory. Nashville forward Austin Watson is eligible to return to the ice Thursday night when the Predators wrap up a road trip in Arizona after Das cut his suspension from 27 games to 18 after he pleaded no contest in July to a domestic assault charge. Das is the same neutral arbitrator fired by Major League Baseball in 2012 after he overturned Ryan Braun’s drug suspension. The NHL fired arbitrator James Oldham in 2016 after his decision to reduce Dennis Wideman’s 20-game suspension to 10 for striking and injuring an official, and either the NHL or NHLPA can fire the neutral arbitrator after each season. The Predators, who hosted the 2016 NHL All-Star Game, will be hosting the 2019 NWHL All-Star Weekend capped by an NHL-NWHL doubleheader on Feb. 10. This is the third straight year the NWHL has held its All-Star Weekend in an NHL market, starting with Pittsburgh in 2017 and Minnesota in 2018. Nashville will host St. Louis with a morning faceoff, and fans will be invited to stick around for the NWHL All-Star Game starting soon after the NHL matinee. The All-Star game will feature a pair of 25-minute halves with Shannon Szabados, goalie for the Buffalo Beauts and a three-time Olympian with Canada, captain of one team and Minnesota defender Lee Stecklein, a U.S. Olympic gold medalist in February, captain of the other team. Patrick Marleau and the Toronto Maple Leafs visit his old team in San Jose on Thursday night with Erik Karlsson still settling in with the Sharks. Goals: David Pastrnak (Boston), 16; Assists: Mikko Rantanen (Colorado), 20; Points: Mikko Rantanen, (Colorado), and Connor McDavid, (Edmonton), 26; Wins: Frederik Andersen (Toronto), 10; Goals-against average: Pekka Rinne (Nashville), 1.47; Save percentage: Pekka Rinne (Nashville), .951.